It’s a peak tourist season now. More than likely, the majority of you have already planned a fantastic holiday in some exotic country. Even more likely, you are aware of the censorship issue that is more or less on the top of its relevancy all over the world. Thus, you may face the “Access denied” notification at the most inappropriate moment, e.g. when trying to tweet your impressions or intending to read news on your homeland websites. 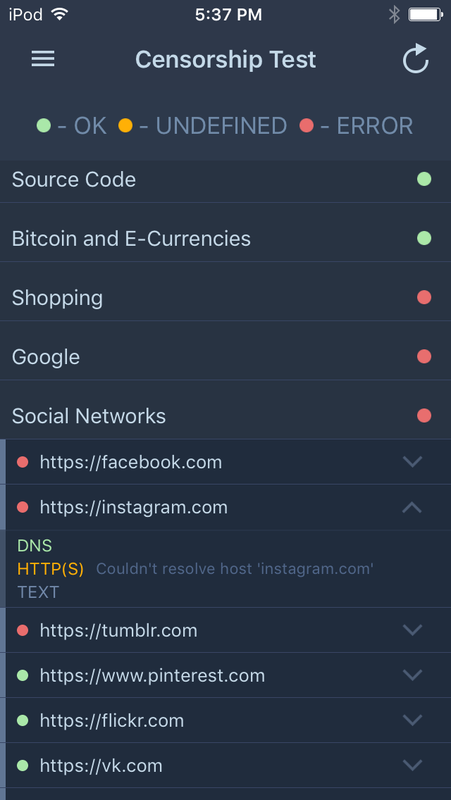 To know what’s happening on the network, what online services are available and what are blocked, you need a solid monitoring tool. Network Tools is the right utility for you. The app is available for iPhone, iPad and iPod Touch for on the go access, giving you the ability to view the current status of the online services you are going to use, and avoid unexpected surprises. Before you start using the analyzer, go to the General tab. Here you will find the information about the availability of the connection, its type (Wi-Fi or mobile data), if your VPN service is enabled, the country and the city of your virtual location, and the name of your external IP. 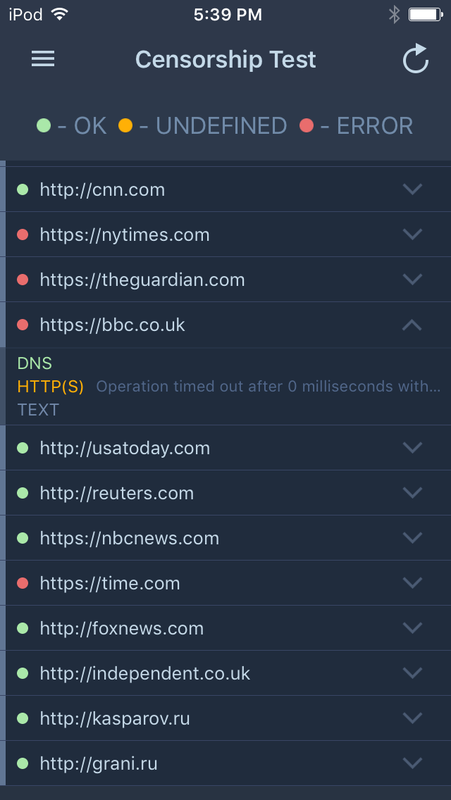 If the monitoring results show all websites you want to use in green, you may not need to use VPN service, unless you care for your online security and anonymity. The situation shown on the 2nd screenshot is more common in such countries like Pakistan or Turkey. The authorities of these countries restrict access to major social networks, Google services, gambling and shopping websites. VoIP services may also be the target. Countries like the UAE, Iran and China face even stronger censorship policy. Here even news websites may be blocked (see the picture above). 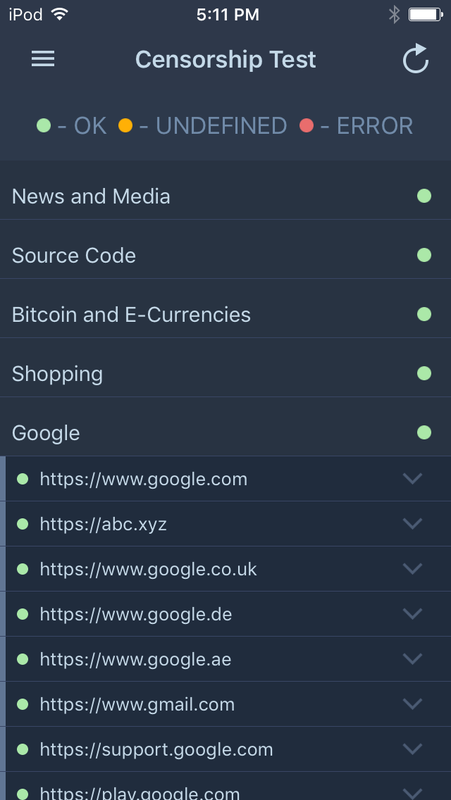 The black list in such countries also includes gambling services, social websites (Facebook, Twitter, Instagram), media (The New York Times, YouTube, many pages of Wikipedia), search engines (Google, foreign versions of Baidu and Yahoo), apps (Google Play) and work tools (Google Docs, Gmail, VPN sites). Just as a reference, authorities of Chine have restricted access to more than 3000 websites with similar content so far. If you find out that access to the web content you use daily is restricted, it doesn’t mean that you have to refuse Skype calls, stop tweeting or watching favorite video back in your hotel room after a long day. Use VPN Unlimited or Private Browser to avoid being blocked. At a click of a button, these security and well-trusted tools will get over the firewall and bypass internet filters, letting you enter the web without any restrictions. Our apps offer you the way to get internet freedom. Moreover, they will effectively block any attempt of cyber criminals to access your sensitive information or track your web activities. With our apps, you will surf the web via direct and untraceable connection from your device to a remote server that becomes your entry point to the global net. We work hard non-stop to provide you with top-notch productivity and security solutions for your smooth online experience. Network Tools is one of them. So, get it now, and instantly check the accessibility of the online services anywhere and anytime. Guys, Network Tools is not available on Android yet. Thank you for the suggestion. We passed it to our development team so stay tuned for some exciting news. VPN UNLIMITED wa freezing my iPhone screen. The Genius Bar recommended deactivating it. That seem to solve the problem. Will this be safe to use on the iPhone IOS9? Dear Marilyn, we are very sorry to hear about this issue. You are the first to report such problem. Could you please describe the steps you took before the screen froze and send to [email protected]? 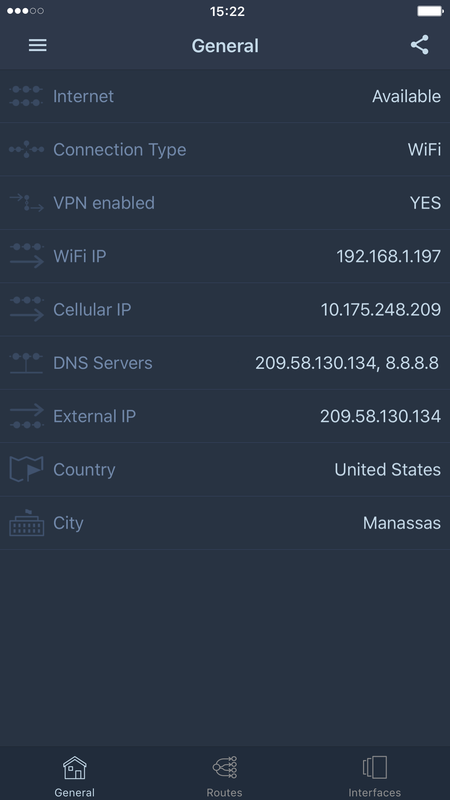 VPN Unlimited should work smooth on iOS9. Please feel free to contact us if you need any assistance. Thank you! Is this also available in Android?